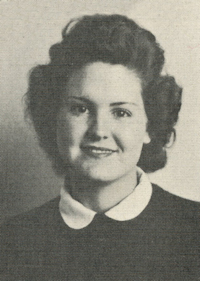 Obituary – Kempka, Nita June (Wood) « Perry High School Alumni Association, Inc.
Glee Club ’44-’45; Library Staff ’44-’45. Nita J. Kempka, of Perry, Oklahoma, came to the area as a child and was raised and educated in Noble County. She died Thursday, March 20, 2008 at Perry Memorial Hospital. She was a graduate of Perry High School and earned an associate degree in fine arts at Northern Oklahoma College in Tonkawa, Oklahoma. Nita and Edward “Eddie” Kempka were married on July 4, 1947 in the Christian Church parsonage in Perry, Oklahoma. Her husband preceded her in death in 1973. She was a homemaker and was of the Baptist faith. Her greatest accomplishments in life were accepting Jesus Christ as her savior and meeting her dear husband. Graveside services will be at 2:00 p.m. Monday, March 24, 2008 in the Grace Hill Memorial Pavilion at Grace Hill Cemetery. Jesse Phillips will officiate.